OK, it’s Saturday. Time for my “look at long term charts” and time to use “weekly tick marks”. What is my “overall context” to set my attitude for the next few weeks? The filter through which to interpret the “news flow”? The background on which to project the “daily” price charts? At the start of a bull run, prices tend to pull up away from the lower Bollinger Band. In a bear market, they pull down from the top one. At a top, like in ’07, we get a ‘failure to advance’ where “higher lows” turn into ‘flat from one to the next’ and ‘higher highs’ do the same. A “rolling sideways” for 9 months or so. (We also see something like that as a ‘pause’ after a long run up in 04, then the rise resumes). Note, too, that at those times the Bollinger Bands go sideways. Just flat. MACD will be ‘red on top’ and ‘pointed down’. At each of those times, RSI has been ‘near 80’ and starts to drop. In the ’04 case, to just a touch below 50, then the run upward resumes. In ’07, the RSI indicator “surfs down” to ever “lower highs” and keeps on going all the way to 20 at the bottom of the crash. 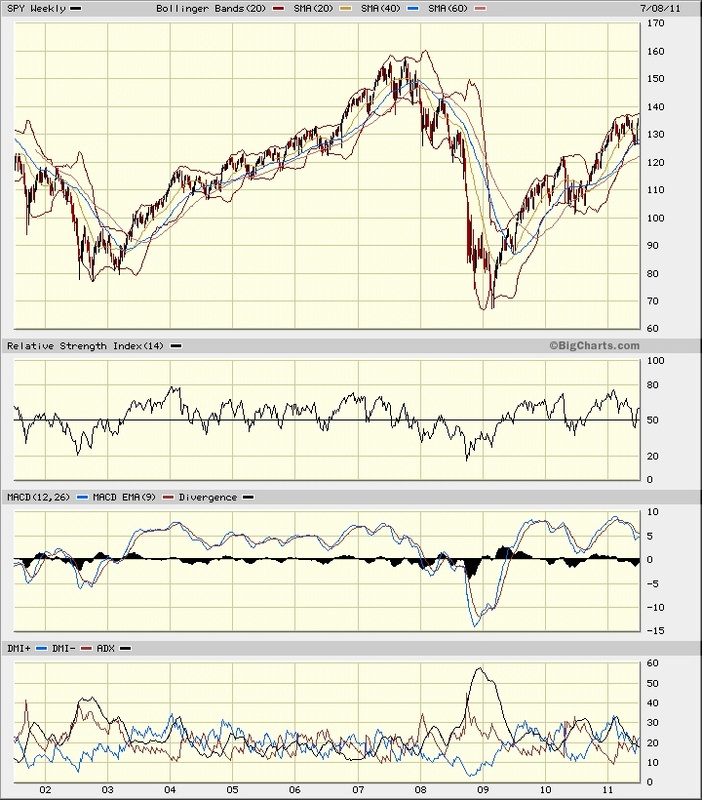 At the ’07 – ’08 transition, MACD crosses the zero line into ‘negative’ territory and gives the last “Bail Now!” call before the plunge of 08. Note too that DMI was “red on top’ then with ADX (the black line) rising sharply. So, what is this chart saying about now? At the right hand edge of the chart, things are always harder to “read” than in the middle…. From the start of 2011 to now, we have “failure to advance”. Highs and lows of about equal size. Typically that means a ‘fall’ soon, but we don’t yet have a ‘catalyst’ to make the fall happen. It can mean “pausing”. Again, an ambiguous interpretation. RSI is just back from a dip below 50 (so looks very similar to both the “pause” and the “crash” preambles…) MACD, too, is largely indistinguishable. It’s above zero, but has “red on top” and is headed down. It also has the little “bulge” at the end that usually precedes a reversal to the upside in one of those long wobbly rises. But that also precedes the “whipsaw” just before a plunge (as in that, roughly, August month of 07; where MACD just hopped to ‘blue on top’ long enough to get folks suckered in, then plunged into early ’08. So I can see why right now the markets would ‘go sideways’ and have ‘trend’ depend on what happens in a few weeks. Do other indicators help any? What about a faster “one year daily interval” chart? On this time scale, it is easier to see that we’ve “bottomed” at about 1275 a couple of times (last month Mid-June and Mid-March) and that the tops have been at about 1350 ( Feb while April is a bit below then above at the end; May runs right along that line, then we drop on ‘failure to advance’ only to ramp back up to 1350 again right now). We can see that the SMA lines are “weaving”, not in the nice “stack” we had at the early part of the year when trend was upward. The stack is “inverted” with fastest 20 day gold line on the bottom, slowest 60 day red line on top. An “inverted stack” to me is a very bad omen. Prices went right on through the SMA stack and are now above it. As a “sideways roller” you expect that, but not as a ‘topping rollover’. Again, and ambiguous behavior. Not willing to drop and roll over. Not trending up either, and not yet in a ‘regular rolling’ movement. The “chop” is not regular enough to predict well. A “news driven market” based on the headlines this week. MACD is ‘below zero’ so negative by the blue line has crossed to above zero and it is IS “blue on top” (not surprising given the recent fast spike up). Yet Slow Stochastic is “high turning lower” and says this run is ending, fast traders step out. So this is what an ambiguous market looks like, and how the indicators can tell you it is ambiguous (even if not giving clear trend indications). So I remember the dictum to “Think in cash. -E.M.Smith” and have gone largely to cash while I have a “bit of a think”… and wait for trend (or at least predictable rolling sideways) to show up. This is a 6 mos daily tickmark close up view. Starting at the bottom, DMI is still “blue on top” but as a slow indicator, will not tell you much about ‘what is to come’ and is mostly telling you ‘it has been up’ (but you can see that in the price trend). Williams %R has an “above 50” “be in” indication, but the top line is starting to decay back toward 50 (see end of April / start of May for a model / example ). While we don’t KNOW it will do the same this time, that pattern is what we are watching for. IFF it happens, be out (for now, just watch FOR it to happen…) The ADX line at about 22 is modest trend strength, but ambiguous as to MACD vs Slow Stochastic being the more reliable indicator. 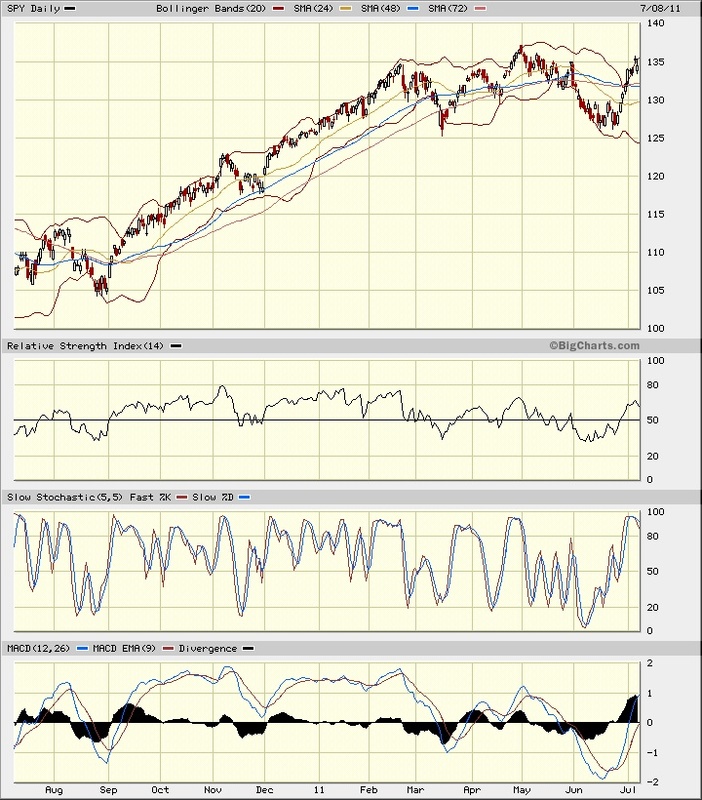 (Below 20: Slow Stochastic, over 25: MACD). In some ways, volume is the more informative. Notice the big volume spikes on bottoms? That Mid-March spike, for example? Also the broader ‘rise’ in the middle of June. Now look at the ‘top’ at the end of April, start of May. Volume drops off going into it. Similar low volume in Mid-February at that top. What is volume doing now? 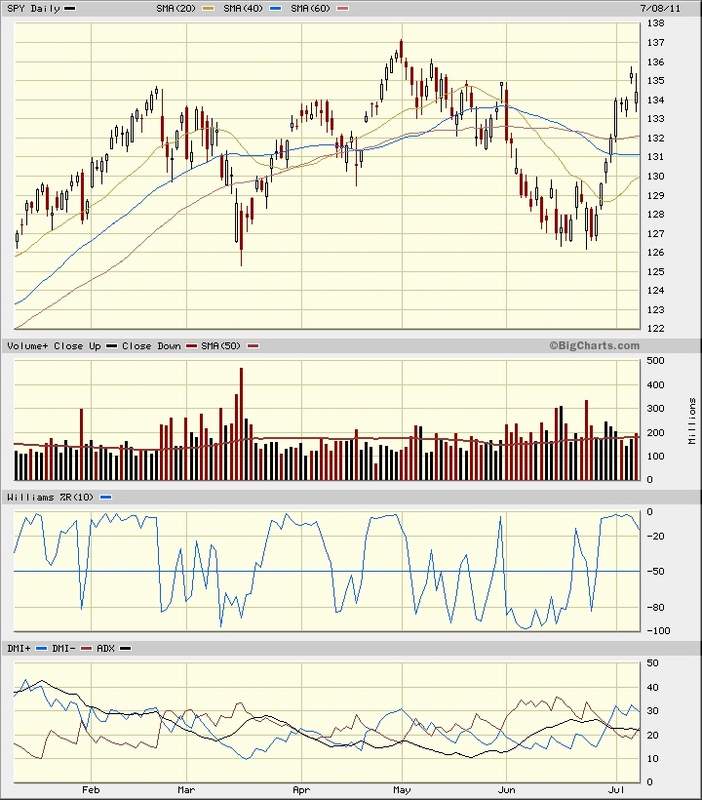 Notice that “eye” of “white space” under the moving average of volume ‘trend line’ where it drops to about 150? Not as low as the “near 100” of the earlier tops, but not too far off, either. Also notice that the black lines are shorter than the red lines on each side. “Down volume” is stronger than “up volume”. The stock markets are a volume seeking mechanism (brokers and market makers make commissions on the volume sold, not the up / down direction…) and “upside volume” is fading while “downside volume” is building. Not ‘definitive’, but a hint. We could see an attempt at more “upside”, or we might just see this thing head down to create some volume. The “complication” here is that the low volume happened on a US Holiday. Near holidays, volume fades anyway. So we have a possible “bogus” low volume reading. Finally, look at the ‘price bars’ on each daily price range. VERY long at bottoms (high price volatility during the day) and very small “squished up” look at tops (low price volatility during that day). Notice that the last three ‘up days’ (prior to the Friday ‘close down’) were very small price ranges, with two of them almost looking like a star. Thin lines of min and max range poking out of an ‘open price vs close price’ box that is more narrow. Looking a bit “squished” like the price bars in early April or mid February near those ‘local tops’. So, based on those price bars and volume action, I’d be worried that this otherwise “ambiguous” set of readings will resolve to the downside. We’ll see as the market develops next week. This entry was posted in Economics - Trading - and Money and tagged S&P 500, SPY, Stock, trading. Bookmark the permalink. I expect a bump up when the Europeans get some resolution to the PIGS situation, and another following whatever asinine deal comes out of conman-gress. Which comes first? Regardless, frundamentals point to a bad black October. I will be watching your reports closely. You can see a similar thing writ small (so far) in the way Australia announced a Carbon Tax of some $23/ton and rising 2.5%/ year until 2015… and their stock market opened some 1.26 % or so down on the news. Have not yet checked the final numbers (morning coffee now…) but will shortly. The Aus Government thinks it is doing A Good Thing and folks are voting with their wallets. ( I’ve no money in Australia as I was expecting this outcome. I’ll not be putting any more in until I see how this stabilizes / if it stabilizes. Looking at EWZ we see it’s gone quite dead relative to SPY on the Sovereign Risk from their new government – it used to be one of my favorite ‘hot tickers’…) I’ll likely make a posting out of it once more data is in hand. Buy the rumor, sell the fact. Old truism from the CBOT pit trade.